McGregor and Devlin christen their son. McGregor posts a picture of Conor Jack with a clenched fist. Watching tape on the 10 pounders. Tell them babies we’re coming. Watching tape on the 10 pounders. Tell them babies we're coming. 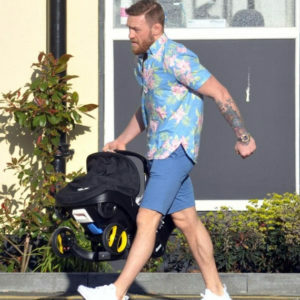 McGregor releases the first picture of Conor Junior. 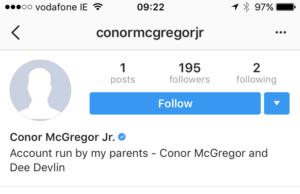 Devlin and McGregor open an Instagram account for their son, Conor Jack McGregor. There’s great news for the McGregor’s and the Devlins. Baby Conor Jack McGregor was delivered last night at 8pm in the Coombe Hospital…He came in at 8 pounds 14 ounces. The whole family are absolutely delighted. We’ve experienced this recently with our eldest daughter and there’s no better feeling in the world than being a grandparent. The parents are absolutely over the moon and everyone is healthy.